Some small dowels. I bought a package of 16 3/16″ x 12″ dowels in the crafts department of WalMart for $1.12. Acrylic craft paints, in Cardinal Red and Gold. A few feet of yarn, heavy twine or string, any color. And, of course – since this is a paper mache project, you’ll need some paper and paste. For the first layer of paper you’ll use newsprint, and for the second layer you’ll need some one-ply paper towels. Bounty Basic brand works good. Don’t try to use two-ply paper towels – they won’t work. You also need some masking tape and some white glue or carpenter’s glue, (or you can use gesso, if you have some). 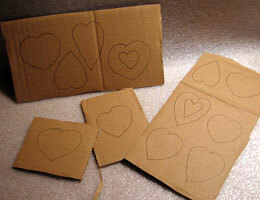 First, draw some hearts on scrap cardboard. Mine are 2 1/2″ tall and wide, more or less. 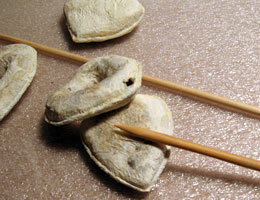 If you draw a smaller heart on the inside of some of them, you will have heart-shaped holes in them, for variety. Now cut out your hearts with heavy scissors or a box-cutting knife (careful!). Now you want to make your hearts “puffy.” To do that, take a small piece of paper towel and wad it up to fit your heart. I started making the puffiness with three pieces of paper towel for each side of the heart. After you get used to the process, you may be able to use just one larger piece. After you have filled out both sides of each heart, go back and cover them with more masking tape, so you have a fairly smooth surface for your first layer of paper mache. Mix up some paste with white flour and water. To make your paste, put about 1/2 cup of white flour in a plastic container that has a lid. Mix in enough water to make the paste about the consistency of heavy cream. Mix very well with a fork or electric mixer, to get rid of all the lumps. Now tear your newsprint into narrow strips, about 1/4″ to 1/2″ wide and about 2″ long. Dip each piece of paper into the paste (you only need to get paste on the bottom of the paper strip). Wipe the wet strip against the side of the container to remove the excess paste. Then carefully smooth the paper onto one of your hearts, going from once side, over the edge, and onto the other side. Use narrow strips for the curved parts, and wider ones for the straighter edges of your hearts. Completely cover each heart so no masking tape is showing, and then place your hearts on a sheet of plastic or a stick-free baking sheet. If you use the baking sheet, you can speed up your project by drying your hearts in an oven, but never turn it on more than 200 F, or the shapes will warp. When your first layer is dry, you can use a bit of sandpaper to smooth any rough edges. Now it’s time to put the heavy string or yarn around the edge of the hearts.We’re doing this to make a nice little border around the hearts that will be emphasized by our gold paint. 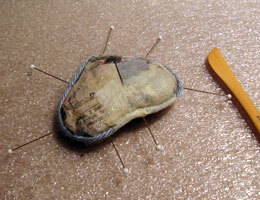 You can attach the yarn temporarily with pins, or use little pieces of masking tape instead. Then you begin to add your second layer of paper. For this layer, we use the one-ply paper towel, torn into small pieces. Place a piece over the yarn, so it hangs down on both sides of the heart. Using a modeling tool or the dull edge of a table knife, push the paper into the indentation between the yarn and the first layer of paper. Look closely at the photo above to see what I mean. I deliberately created a few wrinkles in my paper towel layer, to catch some of the gold paint. See Step 9 to see if you like that effect. 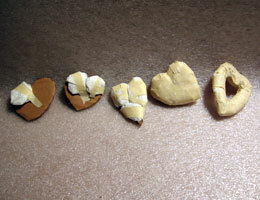 Cover each heart completely with one layer of paper towel, and then set them aside to dry. Your hearts now need a hole, where the “stems” will go. 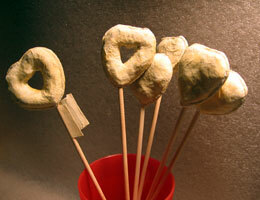 Since you only have two layers of paper mache, you should be able to create a hole by pushing in a pointed stick. (If you don’t have one handy, just use a sharp knife (carefully!) to carve a point onto one of your dowels. 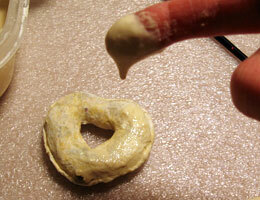 If the paper mache is too hard for this to work, you can use a drill. The hole should go up from the bottom point, just behind the yarn edge, and up into the body of the heart. It only needs to go far enough (perhaps 1/2″) so that your dowel stem will stay on. Test a few of your holes to make sure they’re the right size for your dowels. Your hearts now have a fairly well-defined texture, which comes from the indentations on the paper towels that were used for the last layer of paper mache. To make the texture just a little smoother, you can cover the hearts with some more paste, (or you can use store-bought gesso, if you have some). If you want to use the paste, add some white glue or carpenter’s glue to the paste that is left over from the first two layers of paper mache. I use about a tablespoon of glue for 1/2 cup of paste (but that’s just a guess – I don’t really measure it). Mix the glue into your paste really well, and then slowly add a bit more white flour at a time so you have a thicker paste, like the one you see in the photo above. Then use your fingers to spread this on one side of your hearts, making sure you don’t cover up the indentation around the edge that you made with the yarn. Let the first side dry, and then do the same thing to the other side. When your hearts are completely dry, insert your thin dowels into the end. If they seem at all loose, put a drop of white glue into the hole before inserting the dowel. Now set them into a tall, wide container so you won’t have to set them down when the paint is wet. To keep your paint from getting on the dowels, wrap the top of each dowel with masking tape. If you turn over the edges of the tape before wrapping the dowells, it will be easier to get it off later. Paint each heart with Cardinal Red acrylic craft paint. Then allow to dry. Do define the border around the edge, mix a small amount of gold acrylic craft paint with water, so it will flow smoothly. 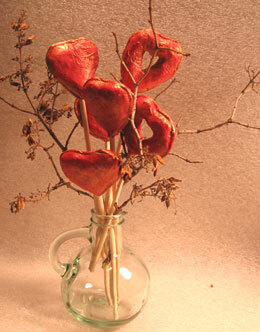 Brush the gold paint onto the heart, and then wipe most of it off with a dry paper towel. Leave as much gold on your heart as you like. It will collect around the edges in the indentation made by the yarn, and it will also collect in the deeper indentations made by the paper towel. You can seeÂ I’ve removed the gold paint in the photo on the right, and let it stay around the edges and around a little wrinkle that I left when I added the paper towel layer of paper mache. I used a few winter twigs to fill out my bouquet. Baby’s Breath would be nicer, of course. When you know what vase you’ll be using for your bouquet, you’ll need to trip the ends of the hearts’ stems, the way you would if you were using real flowers. You can use a small saw for this, or carefully cut the ends with a sharp box cutter. If you try this project and put a photo up on the Web, please let us see it in the comments section below. 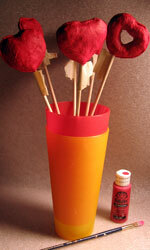 And if you think of another good use of these pretty little “hearts on a stick,” please share your ideas. thanks for providing this wonderful site – full of inspiration. I was actually searching for flowers made of PM, but above Hears Bouquet will do just fine. Now I hope that I get this finished until Valentines Day – still 4 full days left. I found you site on Google and like it a lot. 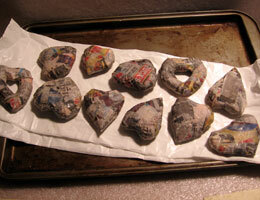 I want to try making jewelry from paper mache. but want to try left over latex paint instead of adhesive. I think that would be a easy adhesive, plus it would help as a filler. I am not sure, but will find out. Using the latex paint, the clean up would be easy with soap and water. Your site is cool and very detailed. I like it. Interesting idea. Let us know if it works.